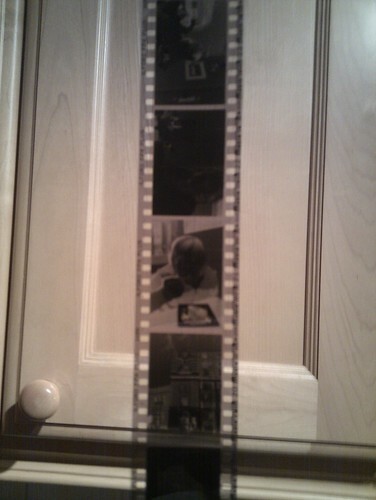 robnunnphoto.com - Posts / Home - Developing My First Roll Of 35mm Black and White Film - At Home! 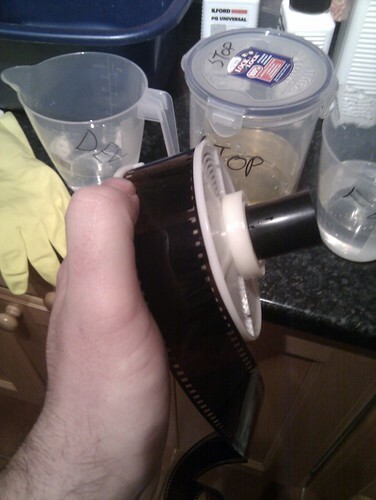 Developing My First Roll Of 35mm Black and White Film - At Home! I can hardly believe it, but it worked. I've developed my own film at home, and it has come out OK! The process was actually quite simple, cheap enough, and something that everyone can, and should, have a go at. The first thing I did was to load up my Olympus Mju II / Stylus Epic with Ilford FP4 Plus 35mm film, and over a couple of weeks I tried to take some interesting photographs. Let's see how I did the home negative processing, and how you could too! Ilford PQ Universal Developer 500ml. (£7). Ilford Rapid Fixer 1l. (£10). Paterson Super System 4 Universal Developing Tank. (£26 new, cheaper second-hand). Dark Bag. (£20, cheaper second hand). Two air-tight containers with measuring graduations. To get started I washed everything with hot soapy water, rinsed it out and dried it all off. I was a little nervous about whether any of this would work, so I had my notes with all the times and chemical strengths, and what to do and when. 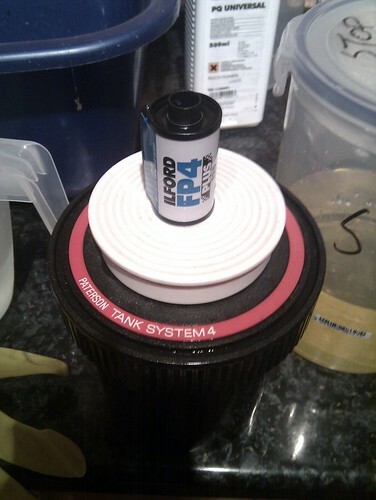 The Paterson System 4 Developing tank I was using needs about 300ml of chemicals when developing a single roll of 35mm. 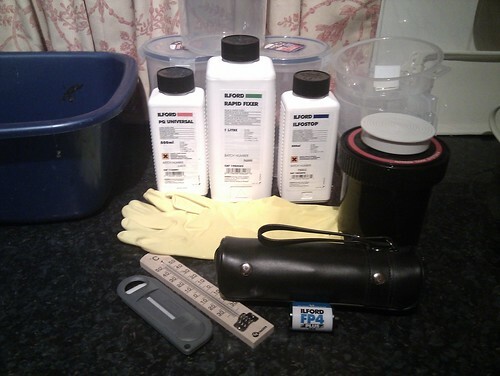 I started off by putting 10ml of the Ilford PQ Universal Developer in a jug, then adding enough tap water to take it up to 300ml, a ratio of about one to twenty-nine. (To get devlopment times and strengths, check out the Massive Development Chart, with the PQ times in the Universal Section). 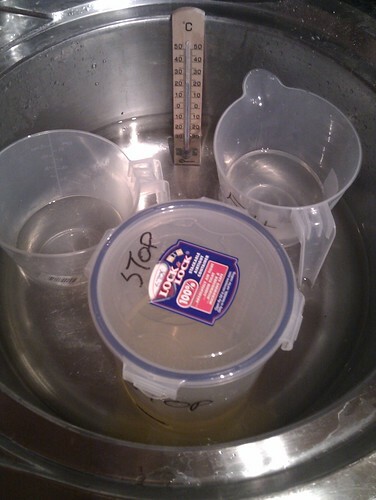 The stop bath, Ifostop, I measured out to approximately 1 to 19, and I wanted to rinse my film twice (I think I read in another post that this was a good idea) so I added 30ml of chemicals and topped up the container to 600ml. The fixer, Ilford Rapid Fixer, I mixed to about one to three, so I added about 75ml of Fixer to a jug, and filled it with water to 300ml. 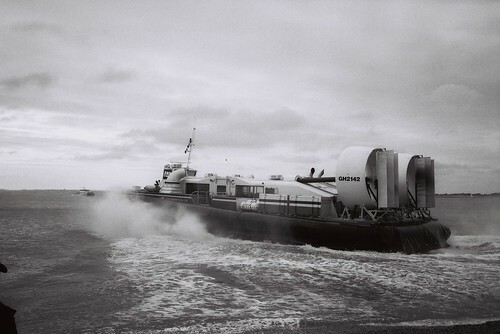 With my chemicals ready I found some old negatives (uncut) and practised rolling them into the Paterson spool, then putting the spool into the tank and screwing the lid on. This is a bit fiddly, but after a couple of goes I was ready to have a go for real in the dark. 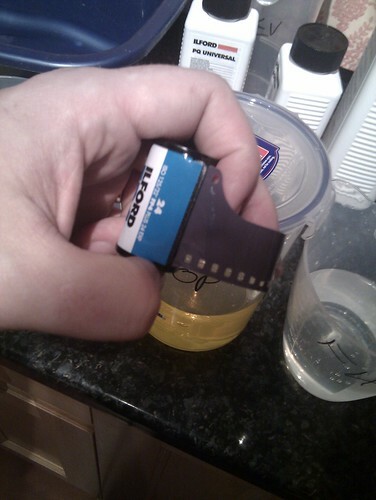 The next step is to get the film out of the cassette and into the tank - but it has to be done in complete darkness. I was going to use my dark-bag, but as I was doing this at night I decided to draw all the curtains in our dinning room, turn all the lights off downstairs, and transfer the film sitting at the table. I laid out the film, the spool, the tank and a pair of scissors, and then turned out the lights. You have to pull some film out of the can and simply feed it into the spool, then ratchet it in. When you get to the end you have to cut the end of the film away from the cassette, load the spool into the tank, fit the centre rod, and screw the lid on. With the lights back on, I took my tank back into the kitchen to get on with the developing. 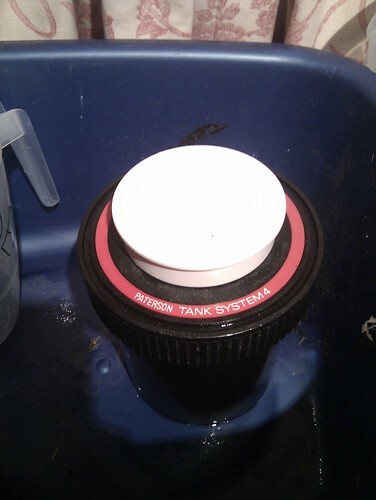 Temperature is quite important when developing film, so I put some warm water in the sink and sat my chemical containers in it, with the thermometer. 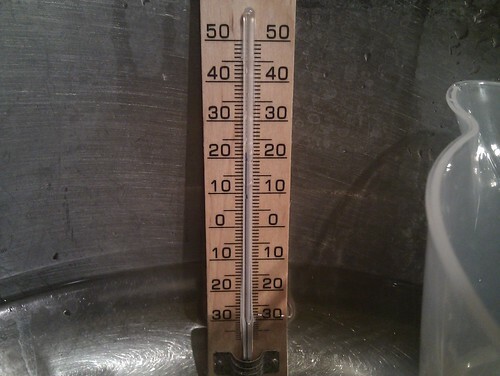 The temperature that is recommended, and from which all the times are worked out is 20 degrees Celsius. Pre Soak. Tap water in the tank and agitated (turning the tank upside down and back again) for two minutes, tapping the tank down to shake free any bubbles. This was then poured away. Developer, in for five minutes. Agitated (inverted) for ten seconds every minute. This was then poured away. Stop Bath Next. Poured into the can (half of the 600ml I prepared earlier), then poured out, and repeated. The stop-bath can be kept to use again. Fixer. In for ten minutes, agitated for ten seconds every minute, The fixer can be stored and used again. Wash. I filled the tank with tap water and shook it about, poured it away, and repeated for ten minutes. Wetting Agent. 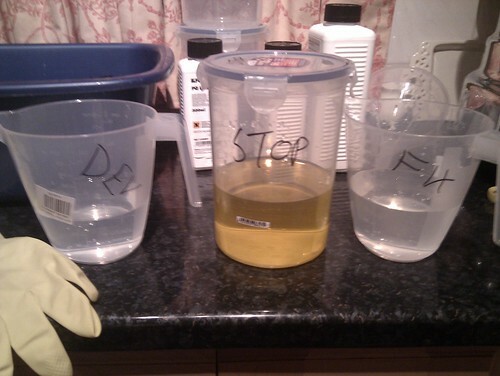 I added a drop of washing-up liquid to a jug of water and poured it into the tank, then poured it straight out again. 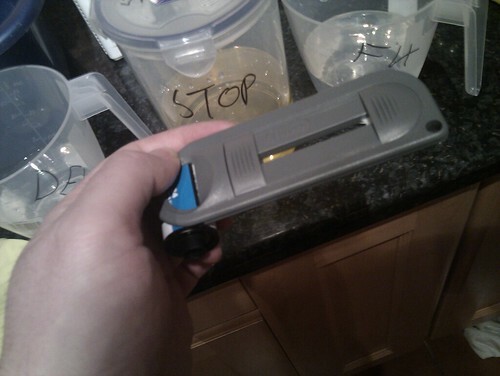 I then unscrewed the tank and carefully took the developed 35mm negatives out, using my fingers to "squeegee" them dry. 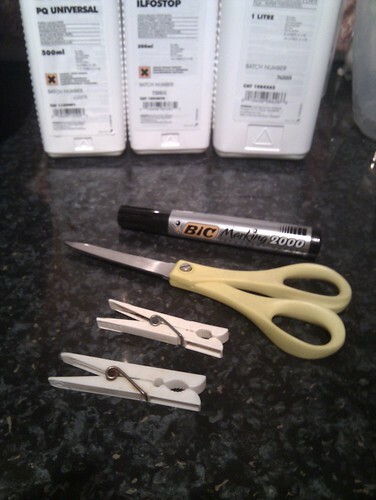 I then hung them up using the pegs and left them overnight to really dry. I washed up my kit, dried it thoroughly, and then packed it all safely away, gave my hands a good scrub an enjoyed a nice cup of coffee while I marvelled at the developed negs - it had worked! I took the negatives to work and scanned them in the lab. I was really pleased at how they came out. A little contrasty and sometimes under-exposed, but OK for a first effort. I'm looking forward to researching a little more about developing, to see how altering my technique can control that contrast and get different looks from my photographs. 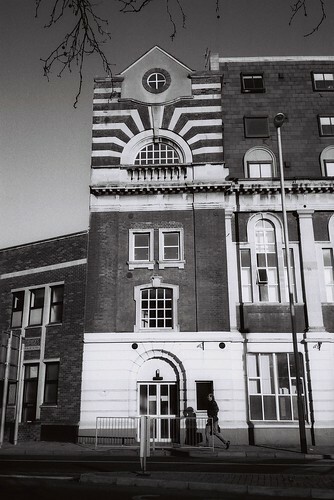 Please have a look at the rest of my home-developed photos! Hey Rob, these are fantastic photos and a great guide aswell. I myself have been looking at doing this for some time and you may have just persuaded me to have a go. What made you choose Ilford chemicals over other brands? Are they easier to use? Those chemicals were the first ones we came across while going through the inventory at work with someone who knew about developing negs. 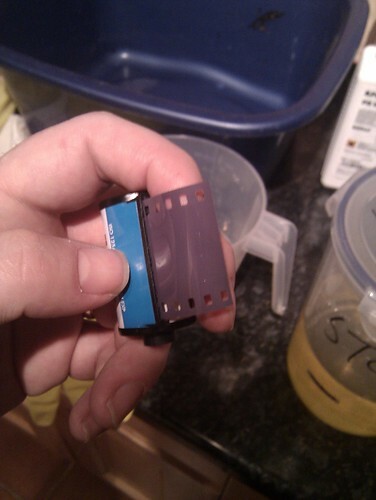 PQ is now usually reserved for paper, but has worked fine on my film. The whole process was very easy, and I can't wait to have another go!